“The Rise & The Fall” starts here! 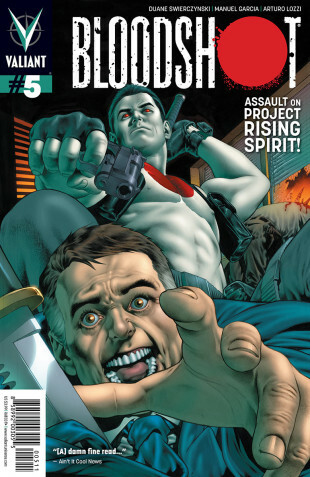 Valiant is proud to present an advance preview of Bloodshot #5 – the FIRST ISSUE of an all-new arc by writer Duane Swierczynski and artists Manuel Garcia & Arturo Lozzi, and a perfect jumping-on point for the series at the brutal heart of the new Valiant Universe! What is Project Rising Spirit’s true function in the Valiant Universe? Who will answer for their crimes? And what darker secrets yet await in the recesses of their classified compound? The answers you’ve been waiting for will beckon on November 14th in the powder-burned first chapter of “The Rise & The Fall,” only in Bloodshot #5! BLOODSHOT #5 – ON SALE NOVEMBER 14th! BLOODSHOT #7 – ON SALE JANUARY 16th!